Nice; what is the openbox theme? ^ my obtheme is arc-grey. The menu you see in the screenshot is from jgmenu_run ob. it doesn't match the obtheme but the colours of the tint2 panel. @ragamatrix, Is that a lua clock? ^Yes it is and it dates from the crunchbang forum, unfortunatly I don't remember the author.. may be easysid but not sure... I tweaked it a little do you want this clock ? Beautiful conky screenshot art ! May we have the conky equalizer link please ? I will gladly comply with your request. 32MiB with logging, ntp, acpi & wireless support, dbus, graphical desktop, terminal & shell (64-bit system). I'm guessing that you systemd people have a higher consumption figure? You even bite many i686 with your hax0r tweaks. Indeed 93.5 KiB >init is just awesome reach. Mr. Poettering, I must protest! 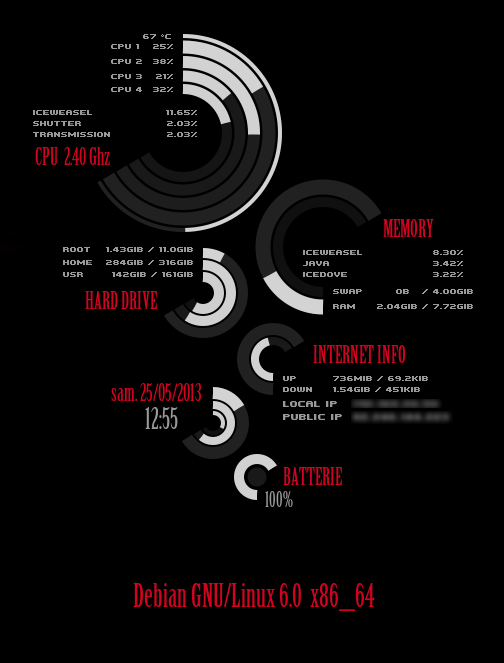 I would love to have an improved conky with radial charts to show all my cpu cores activity, etc as ive seen arownd, but i am useless at making them work, I change the .conkyrc file but the result tends to be absurd, so for sure I'm missing something about this lua part of it... and all guides are a 25 hours read while my patience gives me just for copy this, paste it there with this name, and then do the same with this. 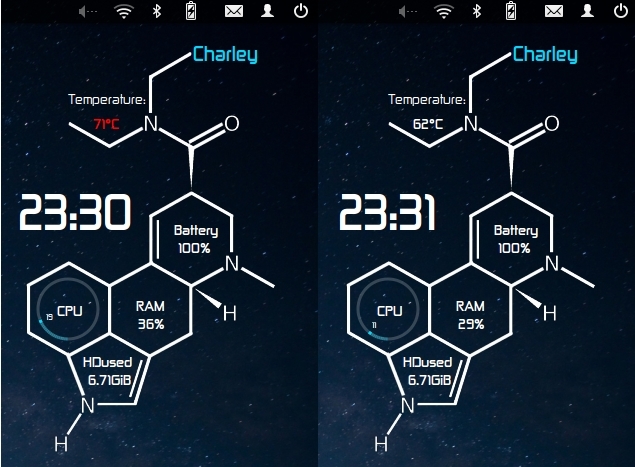 anyone can make a simplified tuto in how to make a conky like this work? But why would you do that!? Because Black Metal, Thats why!